Laurie A. Green's FAREWELL ANDROMEDA is a bit of a challenge to tag because of the twists involved. One of them in particular is best not spoiled. But if you're a fan of twists, then that tells you something about the story right there! Fresh off a painful jilting, the last thing deep space pilot Tiharra Bell needs is another romantic entanglement. Certainly not with the galaxy’s most famous astronomer-who also happens to be single, inconveniently handsome, and a resident of the remote Andromeda Station. But Tiharra soon discovers two terrible truths about Dr. Dante “Donner” Dane 1) he’s not the man he appears to be and 2) he doesn’t have long to live. Before her fourteen day layover is complete, she’ll put her life and career on the line to protect his heartbreaking secret. * Galactic travel is enabled via a perilous dimension known as "DEDspace"
* Heroine Tiharra Bell is an ambitious pilot (she ferries passengers and freight throughout the colonized areas of the Milky Way) and the story is told from her POV. Given the twists involved, it makes sense to be told this way. * Regarding the blurb stating that Donner "…doesn’t have long to live" hints at a twist you probably won't see coming despite some foreshadowing. * Type of romance: forbidden. Donner and Tiharra sort of begin their affair with a one-night stand and the relationship has the bittersweet feel of lovers who know their romance can't last. * How you know FAREWELL ANDROMEDA is an SFR: Donner and Tiharra bond over discussing various astronomy facts. * The secondary characters are all men. Not sure if that's a particularly relevant tag, but I can't discuss the twists, so there you go. * One event in the story leads to brief commentary about ethics in science. 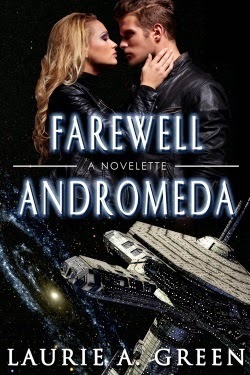 * FAREWELL ANDROMEDA is part of the author's Inherited Stars series, but totally stands alone.